When talking with my students about writing on the history of science, I often warn them to be cautious about oral histories—those long interviews with noted people that review their life’s accomplishments, often years after the fact. The personal anecdotes, tucked away in university and institutional archives, are so attractive to a writer, who is seeking to enliven a biography. But they are a minefield when it comes to accuracy, given the weaknesses of memory. “Trust, but verify” is always my classroom advice. I described the two men as a unique pairing: Oppenheimer, raised in New York City amid privilege and wealth, joining forces with a crackerjack mathematician who “came from the working class" instead of the middle rungs of the ladder. This was based on an interview that Caltech physicist and Nobel laureate William Fowler, who knew both men, had given decades after the fact. One might argue than anyone’s background, when compared with Oppenheimer’s, would look less affluent by comparison: as a young boy, Oppie was driven to private school by a uniformed chauffeur in a limousine. But Snyder’s family, it turns out, was solidly middle class. Hartland grew up in Salt Lake City, where his father served as a civil engineer. I recently learned this from Hartland’s nephew, Arthur Snyder, an experimental particle physicist at the Stanford Linear Accelerator Laboratory. While Oppenheimer was noted for his deep knowledge of literature, art, and music, Hartland has often been cast as the truck-driving boy from the sticks. In reality, he never drove a truck and was an accomplished violinist. Hartland didn’t continue research on black holes after 1939 but did make notable contributions in other arenas. In 1947 he published a pioneering paper in Physical Review on quantizing space-time, a problem physicists are still wrestling with. And later in the 1950s, working at the Brookhaven National Laboratory in New York, he co-discovered the technique of “strong focusing” that allowed ever-bigger particle accelerators to be built. 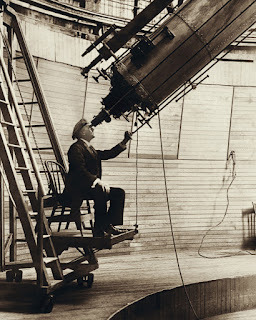 Suffering a heart attack, Hartland died at the age of 49 in 1962, years before black holes were officially accepted as bona fide members of the cosmos. NASA just released its latest news concerning water on Mars; liquid water appears to be creating streaks on Martian slopes. For more on the person who started this whole conversation about water on Mars more than a century ago, click here to see my latest column for Natural History magazine. In my latest Natural History column, I write about the solar system's Lord of the Rings―Saturn. Galileo led the way. Click here to check it out. Cosmic rays are mostly protons, but can also be atomic nuclei or electrons. 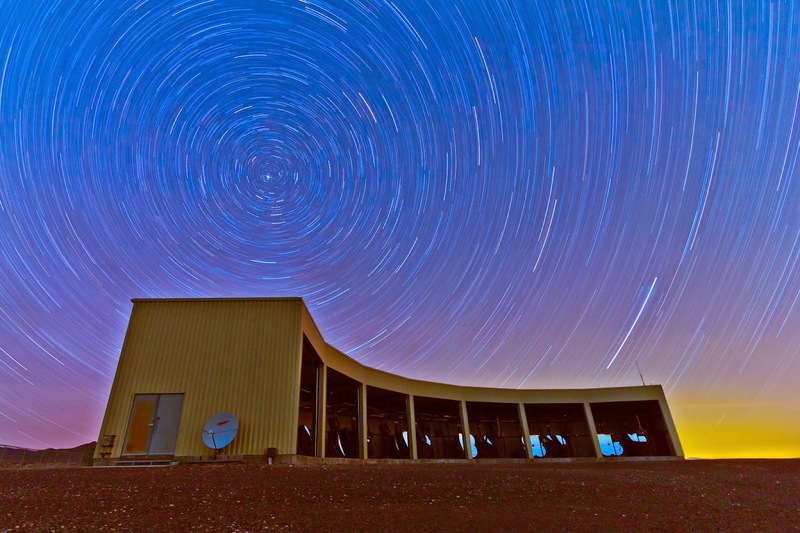 So, why are they called cosmic "rays?" To find out, click here to check out my latest story in Natural History magazine. Who Originated the Name "Black Hole?" In my latest column in Natural History magazine, I discuss the origin of the term "black hole." For many decades, the Princeton physicist John Archibald Wheeler was credited with coining the term. But he likely borrowed it from someone else. Click here to check out the story. Despite the fact that we can peer outward with our telescopes into deep space for billions of light-years, our local celestial landscape is downright murky. 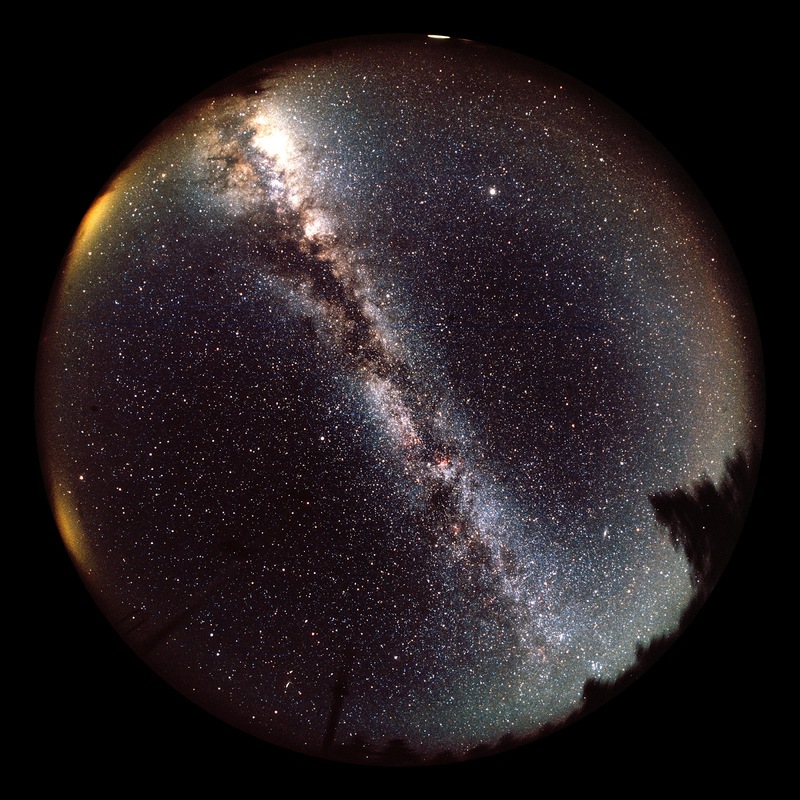 I write about this conundrum in my latest Natural History column, where I discuss how astronomers first tried to map the Milky Way's spiraling arms. Click here to check it out. Pluto was not the first planet to be demoted. Another solar system object was not only demoted from planetary status but got re-promoted later. Read about in my latest column in Natural History magazine. Click here. In 1995 Robert Williams had a crazy idea. Then director of the Space Telescope Science Institute, he decided to use his allocated time on the Hubble Space Telescope to train its mirror on one tiny spot of the sky—a dark, starless region near the handle of the Big Dipper. Over ten consecutive days the telescope took a series of 342 time-exposure photographs, images that were combined and computer-enhanced to produce the most deeply penetrating astronomical picture of its time. It was called the Hubble Deep Field. What this stunning picture revealed were some 2,000 galaxies in different stages of development. Like a geological core sample, it displayed galaxies in the local, intermediate, and distant universe altogether, out to some 12 billion light-years. 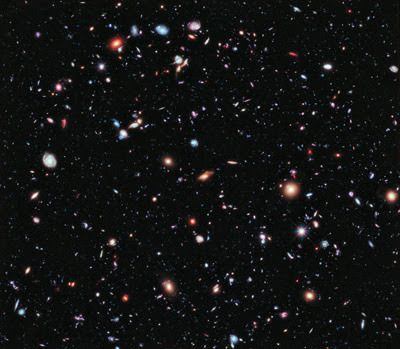 Now a team of astronomers has assembled the eXtreme Deep Field, or XDF for short. They've combined ten years worth of data taken by Hubble (some 2,000 images in all) from a patch of sky in the constellation Fornax. This one digs some 13.2 billion years back into time, to just half a billion years after the Big Bang. All I can say upon gazing at this image is, "Wow!" How can anyone doubt the possibility of other life beyond the solar system when we have these myriad cosmic cradles sprinkled through space and time. My congratulations go out to Jane Luu (MIT Lincoln Laboratory), David Jewitt (UCLA), and Michael Brown (Caltech) for winning this year's prestigious Kavli Prize in astrophysics, which includes a cash award of $1 million. In 1992 both Luu, then at Harvard, and Jewitt, who was based at the University of Hawaii at the time, discovered the first large object orbiting the Sun beyond Neptune and Pluto. They quickly found others as well. 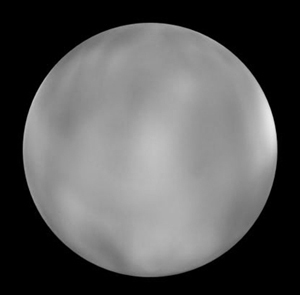 Brown followed up in 2005 by finding Eris, an object about the same size as Pluto but with nearly a third more mass. All in all, these three astronomers proved the existence of the "Kuiper belt," a disk of icy planetesimals long proposed to lie beyond the outer planets of our solar system. Their discoveries ultimately caused Pluto to be demoted to "dwarf planet," joining its more similar companions in the belt. I was particularly thrilled for Jane, who I profiled in 1996 for Astronomy magazine. Click here to read how Jane's life journey took her from war-ravaged Vietnam to the outer reaches of our solar system. In this era that offers us such wondrous pictures of galaxies, showing their vivid evolution over the eons, it's easy to forget that astronomers once thought galaxies evolved relatively little after their initial formation in the early universe. 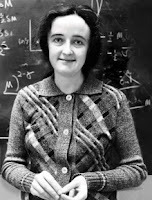 And the woman primarily responsible for changing that view was Beatrice Tinsley. She is said to have "changed the course of cosmological studies." Click here to read about this story in my latest column in the April issue of Natural History. One hundred and fifty years ago, two astronomers in Cambridgeport, Massachusetts, were testing the lenses of a new telescope they were building and in the process discovered an entirely new cosmic creature (although it took a while to figure that out). Click here to read more about it in my latest column for Natural History magazine. Happy Anniversary, white dwarf star! I have another book review out, published in the Washington Post on Sunday, January 22. This time the book is Stephen Hawking: An Unfettered Mind, by science writer Kitty Ferguson. 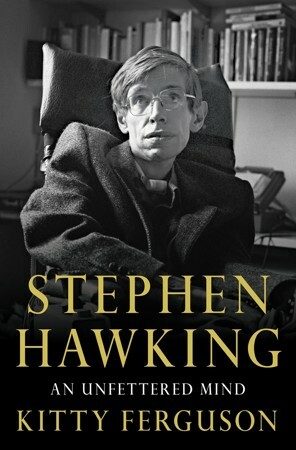 It's a new edition of an earlier biography of Hawking that Ferguson published in 1991. Check out my latest book review, published in the Washington Post on November 13. The book is titled Radioactive. It's an intriguing, visual work about Madame Curie and her husband Pierre. The author is Lauren Redniss, who is both a writer and artist. Each skill is on beautiful display in this unusual presentation. 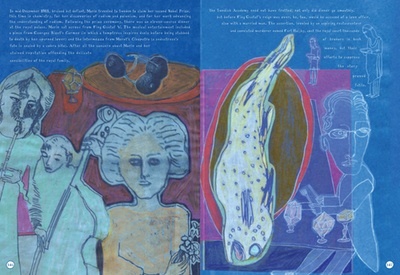 Below, a sample of two of its 210 pages. Does the universe want bacon with that? An international team of astronomers recently used the European Southern Observatory's Very Large Telescope in Chile to capture a unique picture of a hypergiant star situated about 13,000 light-years from Earth in the direction of the constellation Scorpius. 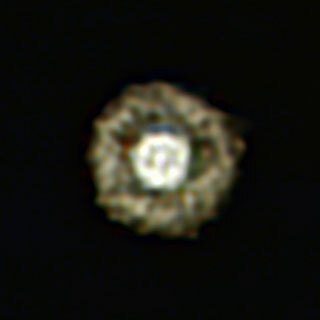 For obvious reasons, they've playfully named it the Fried Egg Nebula. This humongous yellow star shines half a million times more brightly than our Sun (is there a sunblock strong enough?) and is a thousand times bigger. If it replaced our Sun, this 20-solar-mass star would almost engulf Jupiter. Earth would be toast. This star is quite active, hence the two spherical shells of dust and gas that surround the central star, setting up the fried-egg appearance. This material was jettisoned outward in a series of explosive bursts over the last few hundred years. When this hypergiant finally dies as a brilliant supernova some day, watch out! Who Gave the Black Hole Its Name? Book after book attributes the phrase "black hole" to the Princeton physicist John Archibald Wheeler, who in the 1960s re-energized the field of general relativity by helping prove that if certain dying stars were massive enough they would not settle down as neutron stars but continue to collapse to a point, digging a pit into space-time. 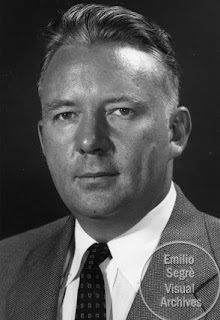 Wheeler liked to tell the tale that he first used the term at a 1967 conference, quickly set up at the NASA Goddard Institute for Space Studies in New York City once pulsars were discovered. Were the pulsars' mysterious beeps coming from red giant stars, white dwarfs, neutron stars? Wheeler told the assembled astronomers they might be the "gravitationally collapsed objects" that he studied. “Well, after I used that phrase four or five times, somebody in the audience said, ‘Why don’t you call it a black hole.’ So I adopted that,” Wheeler told me. 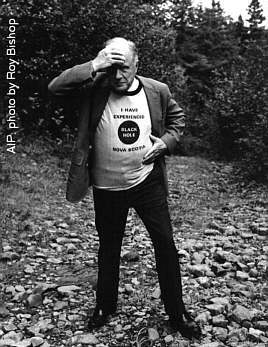 He used the phrase again several weeks later during an after-dinner talk at the annual meeting of the American Association for the Advancement of Science (AAAS) in New York City on December 29, 1967. It made it into print when an article based on that talk, titled “Our Universe: The Known and the Unknown,” was published in American Scientist in 1968. But it's certainly true that the phrase didn’t catch fire until 1967. It seemed to need the imprimatur of John Wheeler, the dean of American general relativity, to give it gravitas. Once Wheeler gave his blessing, the phrase began popping up in the official scientific literature—although over the first year it was usually denoted as “the black hole,” an expression so exotic it needed to be constrained within quotation marks. Is the universe planning to turn blonde? 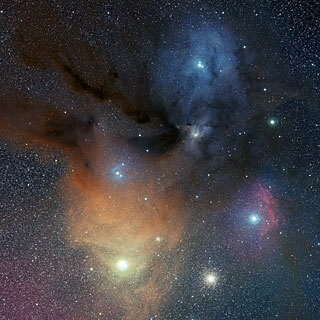 Using a telescope perched high in the Chilean Andes, an international team of astronomers discovered molecules of hydrogen peroxide, the chemical that bleaches hair, in a dense cloud of gas and dust near the star Rho Ophiuchi some 400 light-years distant. This find is more than an amusing curiosity. Hydrogen peroxide is formed when two hydrogen atoms link up with two oxygen atoms (H2O2), a pair of elements critical for life. Moreover, take just one oxygen out of hydrogen peroxide and you get water (H2O). So, further study of this molecule's chemistry out in deep space may help astronomers better understand the formation of water in the universe. I smiled when I heard the news. An international team of astronomers has just announced the discovery of the most distant quasar, the luminous core of a young and active galaxy situated a whopping 12.9 billion light-years away. 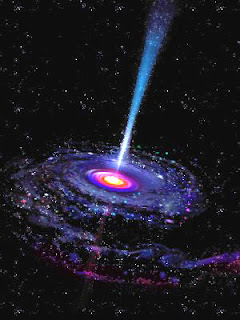 That means the light from this quasar, likely generated as matter falls into a supermassive black hole, started on its journey just 770 million years after the Big Bang. Sky Survey. 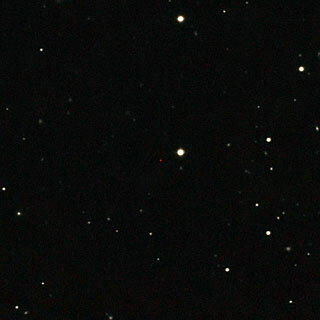 The quasar appears as a faint red dot close to the center. I smiled because this headline has been regularly appearing in the news for nearly half a century, ever since Caltech astronomer Maarten Schmidt recognized the first quasar in 1963. Known as 3C 273, from its listing in a catalog of radio sources, Schmidt's quasar was about 2 billion light-years distant: small potatoes now but a huge cosmic distance in its day. Over the years, the most-distant-quasar record has gotten replaced as often as a newborn's diapers. But now the distances are so great that they present some problems: the light from this newfound quasar suggests that the quasar is being powered by a black hole about two billion times more massive than our Sun. How did such a gargantuan object grow so quickly in the early days of the universe? As team member Daniel Mortlock, of Imperial College London, notes, "It's like rolling a snowball down the hill, and suddenly you find that it's 20 feet across!" Theorists will surely be putting on their thinking caps to find a way. Chicken or the Egg Question Answered? One of the most fascinating findings in astronomy over the last decade has been the unique relationship between galaxies and the supermassive black holes lurking in their centers. Rather than being rare, a giant black hole appears to reside in each and every elliptical or spiral galaxy throughout the cosmos. But which came first? The giant black hole, drawing in material to help form the galaxy, or did the galaxy form first, generating the environment for a dense collection of matter to collapse into a black hole at its heart? Astronomers and theorists from Yale, Rutgers, and the Universities of Hawaii and Michigan have now gathered evidence suggesting that each galaxy and its black hole grow in tandem, starting less than a billion years after the Big Bang. As reported in the journal Nature, the team revealed this by looking at some 250 distant galaxies earlier spotted by the Hubble Space Telescope and searching with the Chandra X-Ray Observatory for the x-ray signals being emitted from each galaxy's central black hole. What they find is a distinct connection: the black holes growing and evolving over time along with their host galaxies. 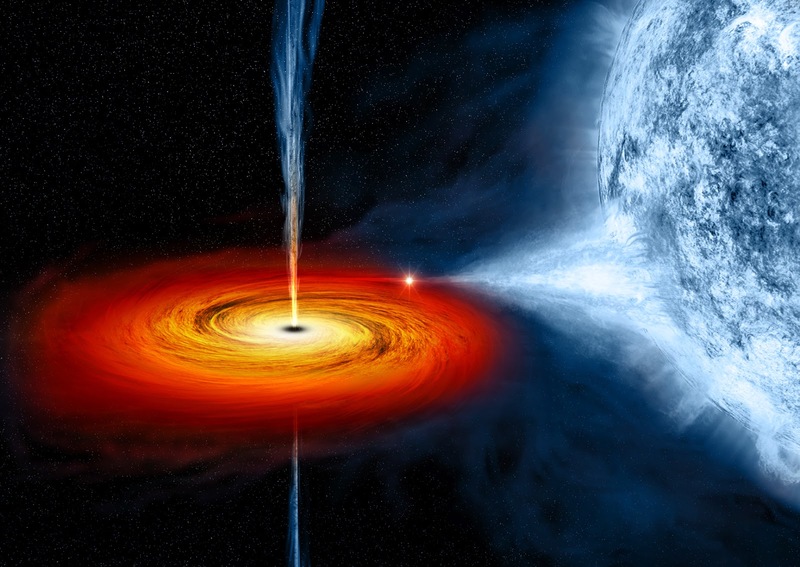 "This finding," says team member Kevin Schawinski of Yale University, "tells us there is a symbiotic relationship between black holes and their galaxies that has existed since the dawn of time." There is something new under the Sun. And it took some 42 years to find it. 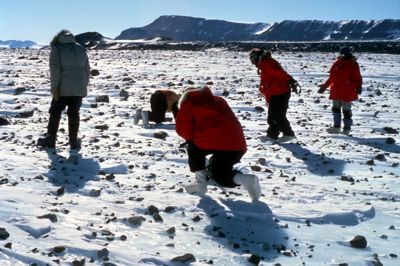 In 1969, members of the Japanese Antarctic Research Expedition found nine meteorites lying on an icy field in the continent's Yamato Mountains. Ever since, these specimens (along with the 40,000 meteorites collected in Antarctica afterward) have been avidly studied. Yet, even after four decades of analysis, some surprises remained. U.S. field team in Antarctica searching for meteorites in 1988-89. One of the 1969 meteorites, known as Yamato 691, was recently examined with a transmission electron microscope located at NASA's Johnson Space Center in Houston, Texas. This 21st-century nanotechnology allowed researchers from the United States, South Korea, and Japan to zoom in on isolated grains in the meteorite that are less than a hundredth the width of a human hair. And what they discovered was an entirely new type of mineral, different from the 4,500 minerals already recognized by the International Mineralogical Association. The researchers dubbed it "Wassonite," in honor of UCLA professor John Wasson, an international meteorite expert. Wassonite is made out of only two elements, sulfur and titanium. Yet these atoms join up to form a crystalline structure that has not been previously observed in nature. The mineral formed some 4.5 billion years ago, likely as part of an asteroid orbiting between Mars and Jupiter. Further study of the novel crystal promises to offer new insights on conditions in the early solar system. "In the words of the great English poet William Blake," says Simon Clemett, a space scientist at the Johnson Space Center and co-discoverer of the new mineral, "we are now able 'to see the world in a grain of sand.'" A common refrain from my science-writing students is, "Where do you get story ideas?" A good place to start is hanging out with graduate students and post-docs, who are often thinking and working on problems at the cutting edge. Many of my best magazine articles when I was starting out involved the work of these pioneering newcomers (many of whom are now the leading lights in their fields). If those interested in writing on astronomy can't make a personal university visit to find out what's on a graduate student's mind these days, there's a new website that offers the next best thing: Called "astrobites," it's a daily astrophysical literature journal written by graduate students for undergraduates. It beautifully fulfills its named mission―providing up-to-date summaries of the latest research in easy-to-go-down write-ups. The graduate students who post these reports―from Harvard, Michigan, UC Santa Cruz, Colorado, Arizona―aim to make active research areas enticing and accessible to undergraduates, but it serves just as well as a convenient overview for journalists seeking hot new topics popping up in the field of astronomy and astrophysics. 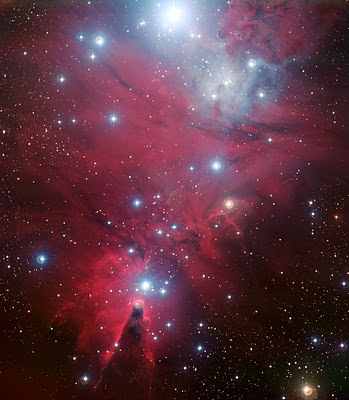 Christmas Tree Nebula: Here just because it's pretty. Ancient mariners sought terra firma―new lands, new continents. Einstein, with his relativistic vision of space-time as a pliable fabric that can bend and stretch, allowed modern astronomers to recast the terrestrial search into a quest for cosmos firma. Glued together by the genius physicist, space and time have become cosmic real estate to be appraised, mapped, and scrutinized.